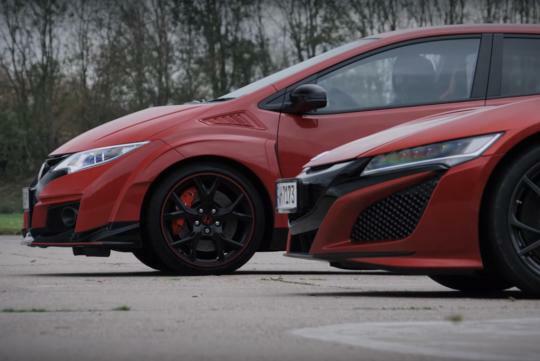 The Honda Civic Type R is one of the fastest front wheel drive hatchback money can buy now. Packing a 306bhp 2.0-litre four cylinder turbocharged engine, the hot hatch is able to dispense the century sprint in a brisk 5.7 seconds. But if you put it against its supercar sibling, the hybrid all wheel drive 573bhp NSX, how will it do? Auto Express has the answer for you in the video below. With a five second headstart to make things even, the result is not one you will expect. I must say this is bizarre when the title says,"...goes head on...". It's like...on one hand you do not want to disgrace your one good product with the other better product so you save it by giving it a handicap and make it a good presentation. In the real world no one is going to give you a 5secs head start just becoz you drive a lesser car. The Type R prices are still stiff and while the NSX is a car not everyone can afford, it would have being great if they build it around the price of a GTR.